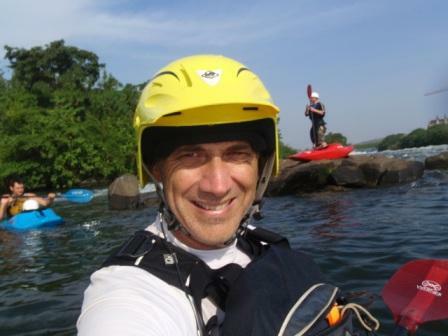 Diary of a middle aged kayaker - Hello world! My name is Jonathan Males, but I’m generally called Mally on the river. I’ve been paddling since 1975 and I still love the sport as much as I did as a 13 year old fat kid. Now I’m 48, and I reckon there’s lots of other people out there like me who are trying to keep on paddling as long as they can. In fact I know there are, because some of them are my paddling mates both in the UK (where I live now) and in Tasmania (where I grew up). So maybe I can bring a new voice to the world of paddling blogs. I won’t be describing first descents or new world records – instead I want to explore what it means to push different limits. The limits that are presented by a body that doesn’t respond as fast as it used to, and by family and work commitments that mean that a day or two away paddling feel as valuable as a week-long expedition. Maybe the biggest limit I’m interested in exploring is the inner, psychological challenge of paddling white-water. Obviously this applies to paddlers of any age, but there are new issues that I notice as I get older and (hopefully) wiser. Like the changing balance between risk and reward, the way my motivation has changed to become more subtle and less ‘gung ho’, and the need to constantly evaluate what’s possible. In the past few years I’ve managed some great trips with mates from Herts Canoe Club – last month we spent a week in Val Sesia, a year ago we went to Uganda and paddled the White Nile. I also paddled the Franklin River in Tasmania two years ago, which was really special because it was the 30 year anniversary of my first trip down in 1979. I’ve started paddling competitive slalom too, and this year I’m racing in Div 1 in the UK. So there’s a some good material to reflect on plus new stuff. Today I paddled on the Lea Valley Whitewater course for the first time. After delays it’s finally open to individual paddlers. I had to do an assessment session, which involved paddling and rolling on flatwater, then running the ‘legacy course’ (180 metres of Grade 2 -3) before venturing onto the main Olympic course. At first it felt a bit like sitting an exam, but once I started paddling on the course I was having so much fun that I just got on with paddling. Both courses are great, but the Olympic course is absolutely first rate. Made more exciting by dodging rafts too. More later plus some photos.